It took Cameron Schilling until after his 30th birthday, but the Winnipeg defenseman finally earned his first NHL point. Cameron Schilling (photo by Cathy Lachmann/BoB). First called up in 2012-13 with Washington, Schilling was playing in his 10th NHL game and his fourth with the Jets. Schilling picked up the secondary assist on a Nikolaj Ehlers goal early in the second period that put Winnipeg ahead for good, 3-2 on Tuesday. Schilling became the 28th player in Miami history to record a point in the NHL. 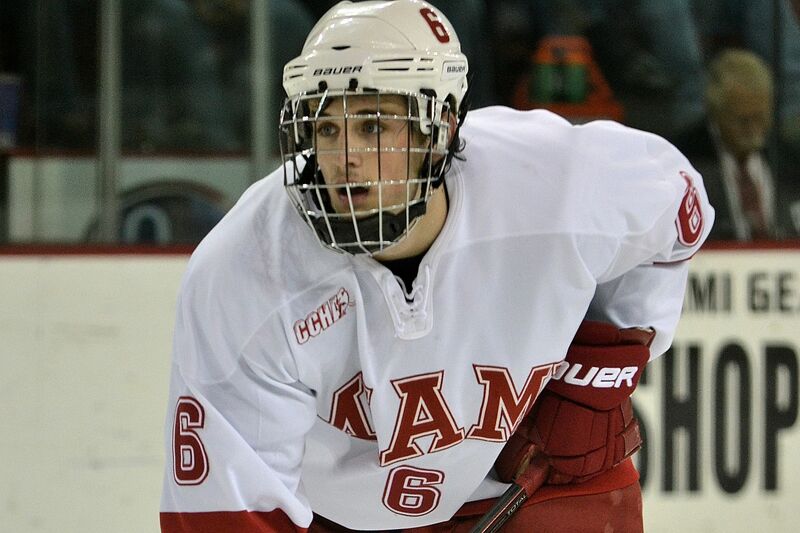 Chris Wideman (photo by Cathy Lachmann/BoB). NHL: Chris Wideman was traded from Ottawa to Edmonton on Nov. 22. In two games since being moved, Wideman has one assist for his sixth point of the season. This was his fourth season with the Senators. from Nov. 18-29 that saw Reilly Smith rack up nine assists, the Vegas forward now leads the team in helpers with 13. Smith has already eclipsed the career 100-goal, 150-assist and 250-point marks this season and is just 39 games of 500. — Los Angeles defenseman Alec Martinez has scored in back-to-back games, including a game winner vs. Carolina on Dec. 2. Martinez has 10 points on the season, and his marker vs. Arizona on Dec. 4 was the 60th of his NHL career. — Calgary’s Austin Czarnik accomplished somewhat of a rare feat by scoring the ninth and final goal in the Flames’ 9-6 win at Columbus on Tuesday. — New Jersey’s Blake Coleman is tied for fourth in the NHL with two shorthanded goals. Coleman’s second SHG came on Nov. 26 at Florida. Coleman has eight goals overall, tied for second on the Devils behind Kyle Palmeiri. AHL: Carter Camper picked up his 350th AHL point on Dec. 1 when the Grand Rapids forward registered a goal and an assist vs. San Antonio. In 465 games in the league, Camper has scored 92 times and earned 258 helpers since 2010-11. — Riley Barber recorded a season-high three points in a win over Binghamton on Dec. 2. Barber is 8-10-18 through 20 games as he is on pace for the highest points-per-game rate of his career. — Anthony Louis leads Rockford with eight goals, including tallies in consecutive games vs. San Antonio and Chicago on Nov. 20 and 23. ECHL: This is Alex Wideman’s fourth pro season, and he is on his best ECHL scoring pace. The Cincinnati forward has 18 points in 18 games – 1.00 per – and his previous best being 0.91 with Indiana last season. Wideman has already picked up his 100th career assist and 150th point this season. Wideman teammate and fellow forward Justin Vaive posted a career-best 32 goals in 2017-18, and he has scored nine times in 22 games to start this campaign. SPHL: Andrew Schmit has notched five assists in nine games since being reassigned to Pensacola. Europe: Matthew Caito has scored 11 goals for Graz of EBEL this season, with three coming in a two-game span Nov. 4-13. Matthew Caito (photo by Cathy Lachmann/BoB). Caito has tallied 11 assists as well, leading the 99ers in defenseman goals, assists and points. Andy Miele is tied for third in scoring on Nivhny Novgorod of the KHL with 20 points. That includes a three-point game against Chelyabinsk in which he picked up back-to-back assists in the Torpedos’ comeback and recorded the clinched with one second remaining. This is the first season a Miamian has played in the KHL since Randy Robitaille in 2013-14. 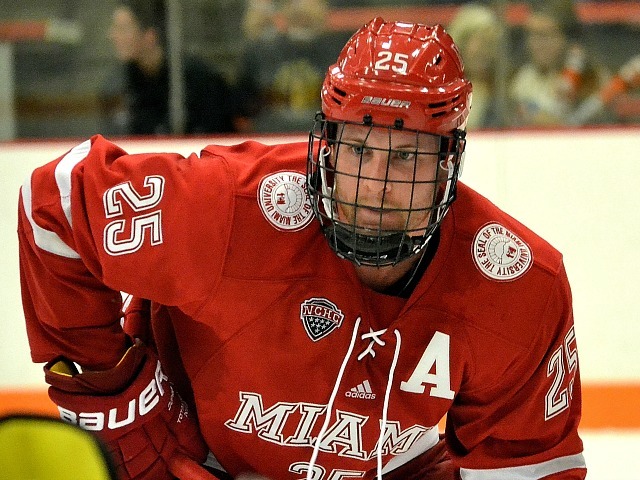 Oct. 11 was a memorable night for Miami hockey alumni. On that date, a pair of former RedHawks reached NHL career milestones, as Las Vegas forward Reilly Smith scored career goal No. 100 and Los Angeles defenseman Alec Martinez dressed for his 500th game. Smith found the net in the third period of a 4-2 loss in Pittsburgh. It was his second goal in as many games and he is currently third on the Golden Knights in points with four. Martinez entered the season with 496 games played, and in his fourth contest of 2018-19, he picked up an assist and went plus-3 in the Kings’ 3-0 win over Montréal. 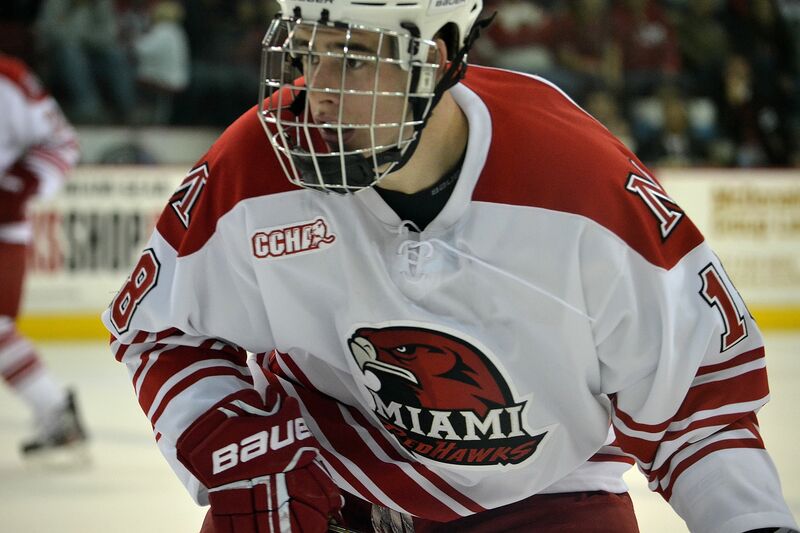 Miami’s Chris Wideman (photo by Cathy Lachmann/BoB). NHL: A torn hamstring ended Ottawa defenseman Chris Wideman’s 2017-18 season after just 16 games, but he scored twice including the game winner in a 5-1 win over Los Angeles on Oct. 13. Wideman gave the Senators a 2-0 lead midway through the first period of that win, and he also sealed it by netting Ottawa’s final goal of the game with eight minutes remaining. Kiefer Sherwood made the Anaheim Ducks out of training camp and has recorded a goal and two assists in his first six games. 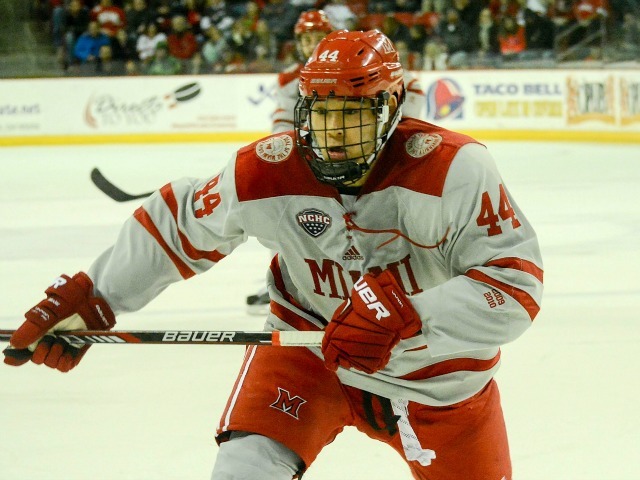 Sherwood left Miami this spring following his junior year and entered this season with just 11 games of AHL experience with San Diego late last season. His first NHL goal came late in Dallas on Oct. 13. His tally made it 2-0 late in the first period but Anaheim would eventually lose, 5-3. 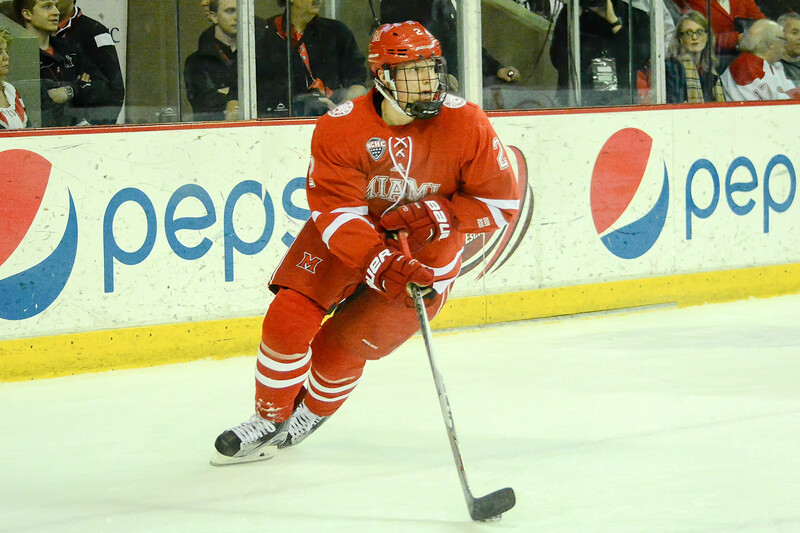 Forwards and former classmates Austin Czarnik and Blake Coleman are off to hot starts. Czarnik has three points in five games for Calgary after spending the majority of 2017-18 in the AHL and playing just 10 games for Boston. Coleman has racked up a pair of markers in four games with New Jersey. He finished with 13 goals and 12 assists last season. AHL: Despite a monster playoff season that saw him record 20 postseason points on Texas’ Calder Cup finalist team, Curtis McKenzie did not make the Vegas Golden Knights’ roster to open this season. But he is tearing up the AHL. Playing for Chicago, McKenzie is tied for 10th-best in the league in points (7) and fifth in helpers (6) while playing just four games. 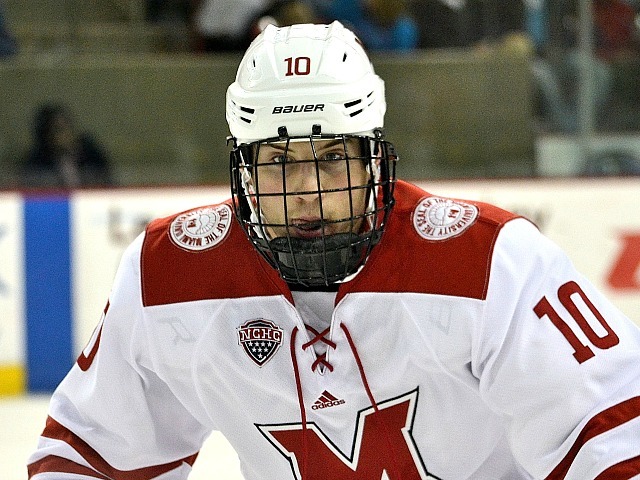 When McKenzie is called up, he will join former Reilly Smith, his Miami roommate and fellow Dallas Stars draftee. Toronto defenseman Vincent LoVerde tallied his 100th AHL assist on Oct. 6. He picked up the helper on the Marlies’ fifth goal in the third period of a 7-5 loss at Binghamton as Toronto’s comeback attempt fell short. LoVerde has played in 369 AHL games – not counting 65 playoff contests – scoring 42 goals and picking up 142 points. 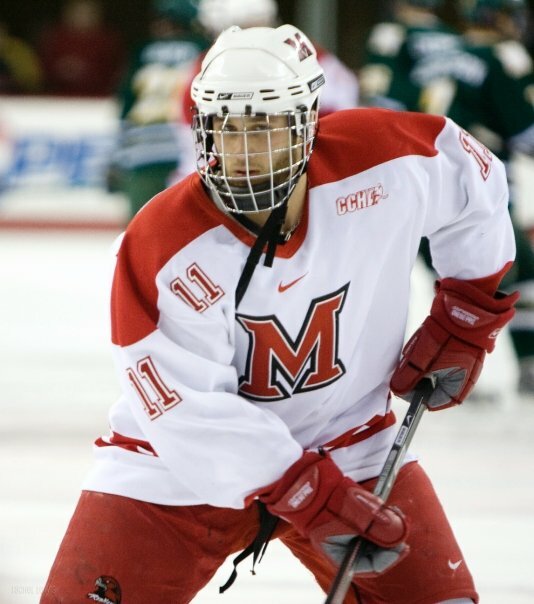 Carter Camper is Miami’s reigning AHL ironman, as he has played 447 games in that league with eight different teams. He already has a goal and an assist with Grand Rapids this season. ECHL: Justin Vaive scored in his first game of the season with Cincinnati. Alex Wideman also made the Cyclones but did not dress for the opener. Taylor Richart opened his third season with Utah by picking up an assist after going 17-24-41 with the Grizzlies in 2017-18. 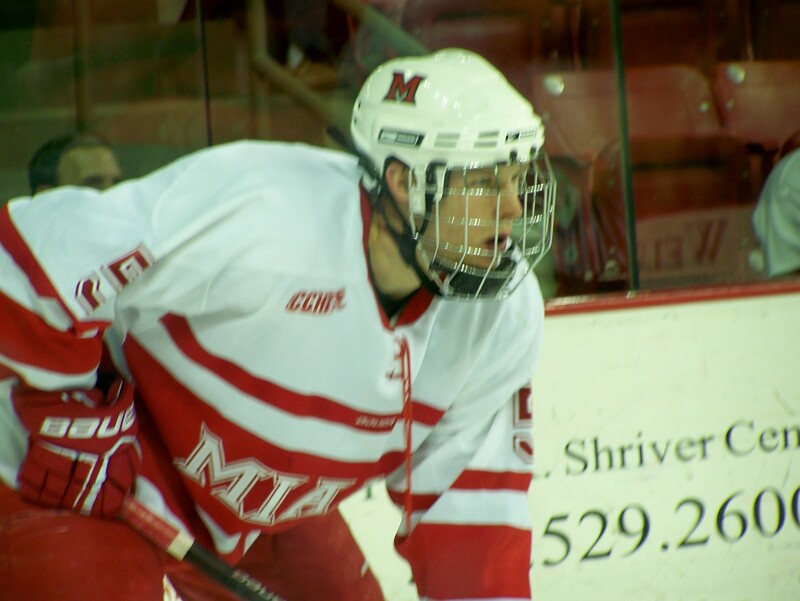 Jimmy Mullin also returns to Kalamazoo for his second pro campaign. He scored 21 goals and set up 24 more in his rookie season with the K-Wings. Europe: Matthew Caito is enjoying Europe so far, as he has notched seven goals and five assists in nine games with Graz of the Austrian League. Several other former Miamians have jumped the pond to play in Europe, including Pat Cannone, Chris Joyaux, Kevin Morris, Colin Sullivan and Jeff Zatkoff. Cannone is 1-6-7 with Inglestadt of the German League DEL. Zatkoff is also in the DEL, tending net with Straubing where he’s 7-2. Joyaux and Morris are teammates with EIHL (English League) Coventry while Tyler Biggs is playing for league rival Nottingham. Sullivan joined Chamonix-Morzine of the French League. 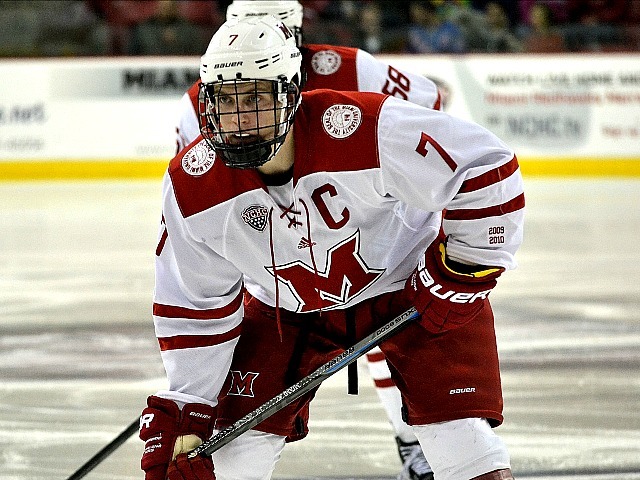 Will Weber (Fischtown – DEL) and Tommy Wingels (Geneva – Swiss A) also jumped the Atlantic this off-season and are rookies with their new European teams. 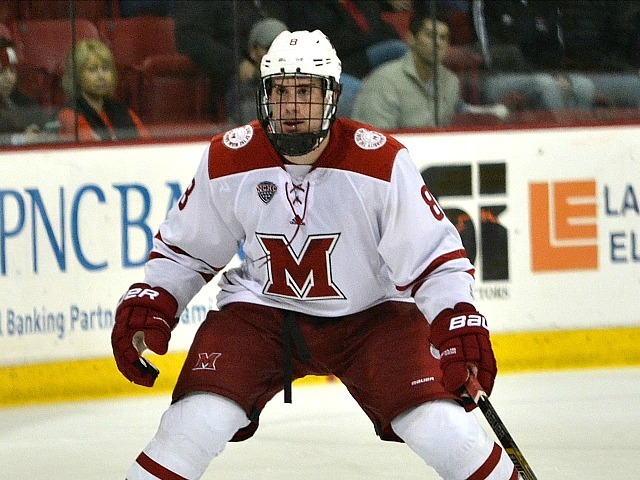 Andy Miele joined the Russian KHL this season, and he is already 5-5-10 in 16 contests. Here are the current statistics for former RedHawks playing round around the world, and you can check them on our site at any time at this link: https://blogofbrotherhood.com/redhawks-in-the-pros/stats-for-miamians-in-the-pros/.